ABPDU hosts different centrifugation units including basket centrifuge, Andritz D2L decanter, Alfa Laval MBPX 404 three-phase disc stack centrifuge, and dead-end centrifuge with 6x2L capacity. Andritz D2L decanter allows rapid solid liquid separation with maximum flow rate of 6 m3/h when separating slurries with 1% (w/w) solid. Alfa Laval DSC can be used for S-L, L-L, & S-L-L separations with the inlet process liquid flow rate 50-500 L/h. We also host Pellicon XL and Cogent M1 Milipore Tangential Flow Filtration (TFF) systems. These systems can be used for small (100 mL) to medium scale (~100L) protein concentration as its membranes size vary from 0.01 to 0.5 m2. Filter membranes with various pore sizes (ultrafiltration: 5-1000 KDa; microfiltration: 0.1-0.65 um) can be used to separate and concentrate specific molecules. We also have EFS Plate and Frame Filter Press, which can be used for solid-liquid separation. The filtration area is up to 7.3 ft2. The filter paper pore sizes range from 0.25 to 15 um. ABPDU is also equipped with KARR® Reciprocating Plate Extraction Column with 25 mm diameter, retention volume of ~ 2L, agitator for 0-400 spm, explosion-proof motor, and metal/PTFE plate stack. This system can be used for L-L separations, continuous and efficient recovery of immiscible or partially miscible liquid biofuels from fermentation broth. The facility is equipped with a 2’’ diameter scale wiped film evaporator (WFE)/distillation unit. The hybrid designs combine WFE and fractional column for simplicity when separating materials that have close boiling points. Medium vacuum (to 0.1 torr) and a high surface area external condenser are utilized. The molecular distillation design is selected for when the distillate is of high boiling point and/or extremely heat sensitive. High vacuum (to 0.001 torr) and a close proximity internal condenser are utilized. ABPDU is also equipped with a Qsonica Q700 in-line continuous sonicator (20L) and Mini DeBee Homogenizer (12L/hour) cell lysis systems. With a Labconco FreeZone for ~6 liters of bulk freeze drying, the facility can process biomass for intracellular products. ABPDU also hosts AKTA Avant 150 equipped with UNICORN 6.1 (with integrated DOE capabilities). 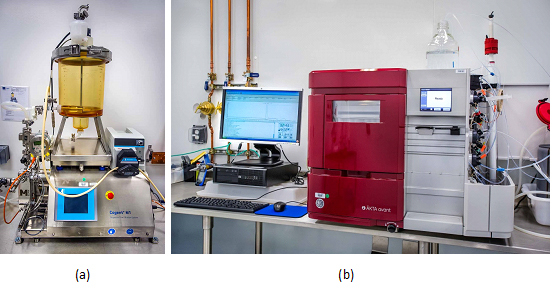 The AKTA Avant is a fast protein liquid chromatography (FPLC) system intended for process development. The system can be used to screen for optimal choice of columns, media and running parameters to purify selected proteins. Unique aspects The facility is well integrated with upstream processes. It also encompasses a fully analytical lab with high performance liquid chromatography, gas chromatography, rheometry, calorimetry, infrared spectroscopy that can provide chemical composition, physical parameters, and much more information along the bioprocess. This information is useful in fully understand the combinations of materials and the processes they are subjected to. The ABPDU also works closely with Lawrence Berkeley National Laboratory’s Molecular Foundry, a user facility with much more advanced analytical equipments such as Scanning Electron Microscophy, Differential Scanning and Isothermal Calorimetry, Dynamic Light Scattering, etc. This laboratory is currently utilized by several startups and big companies along with various BETO-funded projects including the Co-Optima Project, Agile BioFoundry (ABF), Separations Consortium, and Feedstock Conversion Interface Consortium (FCIC) AOPs.